Brent Henderson harvests soybeans on his farm near Weona, Ark., in 2017. That crop showed symptoms of dicamba exposure. Henderson switched to Xtend soybeans the following year, he says, as "insurance" against future damage. 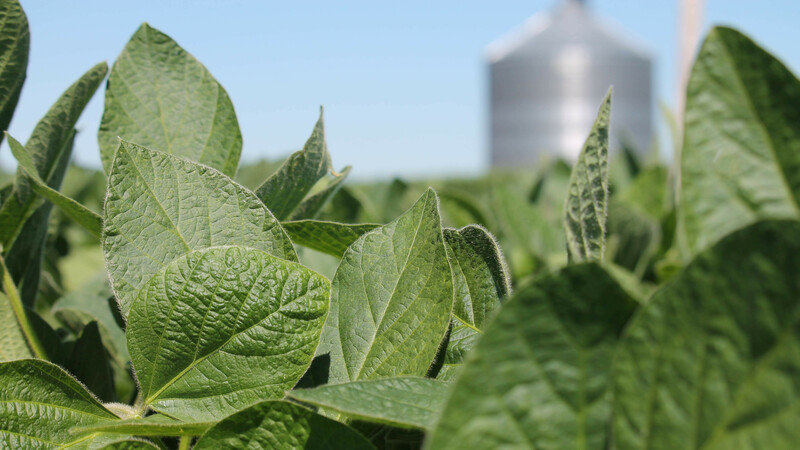 Soybeans have been at the center of a controversy over the use of dicamba, an herbicide which can drift over property lines and cause damage to neighboring crops. A new type of soybean seed, engineered to withstand dicamba, is seizing a majority of the market. When a product is successful, usually it's because people really like it, right? But some farmers say they are buying a popular new kind of soybean seed partly out of fear that if they don't, they won't have a crop next year. The soybean is resistant to the herbicide Dicamba. And farmers say that the soybeans are driving other seeds out of the market. Now farmers are taking Monsanto to court, claiming this is an antitrust violation. NPR's Dan Charles has the story. 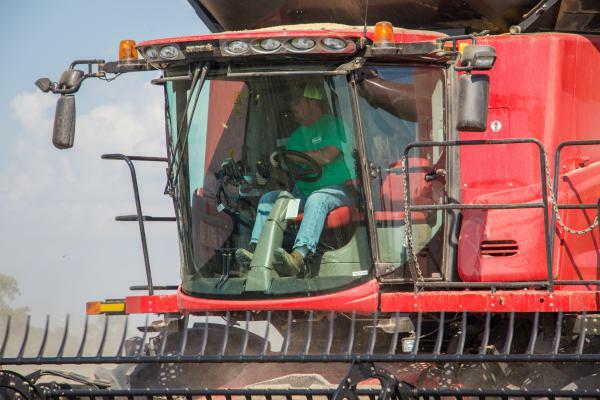 DAN CHARLES, BYLINE: The biggest new technology on Midwestern farms these days is a new family of soybean seeds. The seeds go by the trade name Xtend. They're worth an estimated billion dollars a year to the company that sells them - Monsanto, now owned by Bayer. And Dennis Wentworth in central Illinois is totally onboard. DENNIS WENTWORTH: 100 percent of the soybeans that we plant are Xtend soybeans. CHARLES: These new soybeans have been genetically tweaked so they don't die when you spray them with a herbicide called Dicamba. Now Wentworth can spray this weed killer right over his fields of Dicamba-tolerant plants. WENTWORTH: It controls the weeds. It kills the weeds. That's the bottom line. It doesn't affect the crop. CHARLES: In just three years, these new varieties have taken over 60 to 75 percent of the American soybean market. Farmers say they've made the switch because Dicamba's better at killing the weeds. Some farmers, also Bayer, say the new seeds produce a bigger harvest. But a lot of farmers say there's also a third reason. For Randy Brazel in southeastern Missouri, it was the only reason. RANDY BRAZEL: I just had to go along with the Dicamba program whether I like it or not. CHARLES: Brazel already had his seeds ordered for next year - not the new Dicamba-tolerant soybeans. He was going to use other weed killers. But then in mid-December, he got a phone call. BRAZEL: I have a neighbor, a friend, who calls me. And he says, I am going to have to go Dicamba. CHARLES: And that changed Brazel's plans completely because Dicamba has this well-known problem. It sometimes blows away after you spray it, across property lines into neighboring fields. Lots of people have tried to stop this. Chemical companies have reformulated the product. Government regulators have restricted how and where farmers can spray it. They've put these rules on the product's label. And still, Dicamba fumes have curled up the leaves of sycamore trees and millions of acres of traditional soybeans across the Midwest and the mid-south. So Brazel said, I can't risk it happening to me. He canceled his entire seed order, bought the new Dicamba-tolerant soybeans instead. BRAZEL: Then I have to get on the phone and call every other neighbor and say, listen. I did not want to do this. But I am going to be forced to grow Dicamba. Well, then that forces all those neighbors to grow Dicamba. Well, then they have to call all their neighbors. And eventually, what you have is a monopoly. CHARLES: Among the losers in this situation are seed companies that are selling competing products, like Rob-See-Co in Elkhorn, Neb. Rob Robinson is the CEO. ROB ROBINSON: We don't believe in Xtend. We think it's too complicated. It's very difficult to meet the requirements on the label. And it causes too many issues with neighbors. CHARLES: Like fights over damaged crops - Robinson says he's lost customers over this. Most of them, he says, want to buy Xtend soybeans at least partly to protect their crops from harm because their neighbors are spraying Dicamba. He says it's part of the sales pitch for these new seeds. CHARLES: Wait. What do you mean, exactly? You mean people selling Xtend are actually using this as a selling point. CHARLES: Seed companies will remind farmers if you plant Xtend soybeans, you won't see any damage from Dicamba. You won't have that conflict with your neighbor. ROBINSON: Now how far that goes up the management chain within Monsanto and now Bayer, I can't tell you. But I know locally that it - that's the message. CHARLES: Several law firms now have filed a lawsuit on behalf of farmers, arguing that Monsanto violated antitrust law by selling Dicamba-tolerant seeds. The lawsuit claims that the company understood that the risk of drifting Dicamba could drive competitors out of the market. Bayer has asked the court to dismiss that lawsuit. A decision is pending. Bayer declined NPR's request for an interview about this issue. In its public statements, the company insists that if Dicamba's used properly, according to all the rules, it won't cause any harm to neighbors. It says farmers are buying Xtend seeds solely because they offer better weed control and higher yields. It also points out that reports of Dicamba damage were down sharply last year after the company and other groups held hundreds of training sessions for farmers. The company's critics, though, say fewer crops are getting damaged, in part, because so many farmers have decided to buy Bayer's product - crops that Dicamba can't harm. Dan Charles, NPR News. Transcript provided by NPR, Copyright NPR.